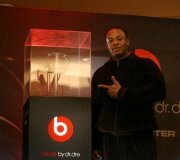 HTC has invested in Beats Electronics, a U.S. headphones company rap artist Dr. Dre helped found, as part of a move to improve the audio on the Taiwanese smartphone maker's devices. The partnership, announced on Thursday, will lead to a line of HTC devices integrated with Beats "sound innovations", according to a statement from the company. The devices will be available this fall. Beats Electronics is a developer of high-end headphones, which claim to reproduce the sounds heard in professional recording studios. The company also helped build an audio system for Hewlett-Packard's ENVY laptop series. HTC is investing US$300 million for a majority stake in Beats, which also has Universal Music Group as a stakeholder, according to media reports. HTC did not respond to requests for comment. It said that after its investment, Beats will continue to operate autonomously, and maintain its partnerships with HP, Chrysler Group and Monster Cable Products. The investment in Beats will help HTC differentiate its Android devices against rivals including Motorola, Samsung and Sony Ericsson, said Daryl Chiam, an analyst with research firm Canalys. The newest Android smartphones are already starting to feature very similar hardware offerings, such as dual core processors, 3D screens, and the ability to connect to faster fourth-generation LTE (Long Term Evolution) networks, creating a need to differentiate, he said. "It doesn't surprise me HTC would do this, considering the competition, especially among Android based vendors," Chiam said. "I think they will be able to use this as differentiator not just for music phones, but for mass market models." HTC acquired Dashwire in Seattle earlier this month to boost its mobile backup and sync services.